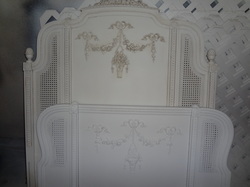 Here is the headboard to a gorgeous French Provincial bedroom set I found. 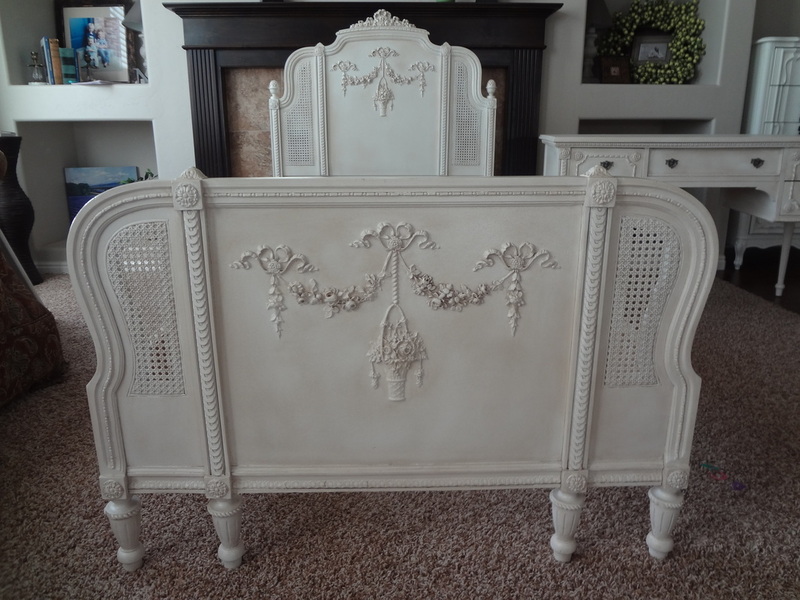 I was instantly in LOVE with this piece and knew it would be perfect in my little girls room! 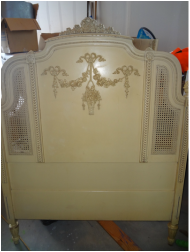 I love the French provincial style and to be honest I have changed and sold her bedroom suite 3 times! Each time it got cuter and cuter and when I saw this it was a done deal. These pieces were made in the early 1900's. 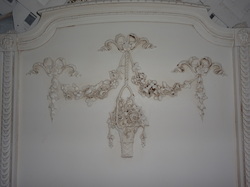 They have the original wooden appliques and they just melted my heart.... anyway... I could go on and on about my love for these pieces but onto glazing.... (just thought you needed a history about the piece and why I chose to antique and glaze it). I sanded this baby down, primed it then painted it with two coats of off white paint. She was ready to go. 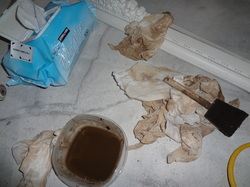 A nice 97 cent foam brush, wipies, a wet cloth, a dry cloth, the glaze and a container with water. We have tried a TON of glazes and there are sooo many out there but we like to use raw umber. I purchased mine at KWAL paint. It is actually the color that they put in their machine to tint paint. It is thicker and I can dilute it as strong or as light as I want and there is plenty of dry time because if it is too dark you can get your wet wipe and wipe it off or tone it down. I used an oil based glaze and hated it on my white and cream colored paints because it warmed the pieces up too much and I couldn't get it off. The regular glaze is ok but you just have to work a little faster to wipe it off before it sticks into place. This is one of those things you will just have to try. It is like shoes, everyone has different taste and styles when it comes to glaze! You will notice in this picture that the right side is wiped and the left hasn't been yet. You will take your dry cloth once the piece has the glaze on it and start to wipe everywhere, I like to use a circular motion so you don't see streaking on the piece. Just rub it all over. 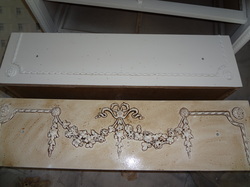 Where the glaze is darker in the details, it will stay naturally and the piece will stand out. Be sure to wipe everywhere, don't be afraid. Once the piece is wiped, you may want it a bit lighter or you may see a streak that is bugging you. You then take a lightly dampened rag and wipe the piece all over with that. 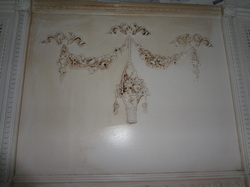 This will remove the streaks and lighten up the piece. You can do all these steps as much and as many times as you want until you get the desired look for the piece. We usually wipe a piece down and add more about 3 times before we get the look we want and the evenness. It makes a huge difference! 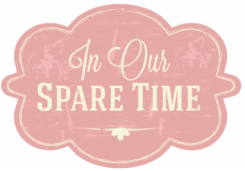 It gives it that antiqued look that we LOVE! This is almost finished. Can you see where the right vine has a few really dark spots? You don't want it to be too matchy matchy so I left most of them, but you can dab them out a little with a Q-TIP in the end. Glazing takes time and practice but it is like painting, it is an art and so much fun. I look at my first glazing pieces and I think "whoahh, that's not so great" but really, it just takes a little time to build your masterpiece. Be pacient and remember it looks better when it isn't too perfect. See what a difference glazing makes? The bottom is just painted and the top is all glazed. It adds so much character! Happy glazing everyone!! !